I will be the first to admit that I am an exceptionally poor judge of volume. I can never put away leftovers without dirtying at least two containers; the first one I choose is always either too big or too small. Along the same line, I have never been able to judge how much to fill two singles bobbins so that I don't have any leftovers after plying. Even weighing the unspun fiber doesn't help, as my spinning isn't entirely consistent. I'm sure I'm not alone in this plying problem, but it bugs me to no end to have bobbins cluttered up with leftover singles. After struggling with this for several years, I finally decided that I needed to learn to ply from a center pull ball. There are several ways to make these, but I learned to do it with a ball winder. I use my ball winder for balling skeins of yarn off my swift too, so it is a useful tool to have around. I wind the singles onto the winder directly from the bobbin. The yarn I am plying here is the white Shetland from the second batch from Cathy. Before taking the ball off the winder, it is important to find the two ends. One comes from the inside of the ball, where it was secured in a notch on the core of the winder. The other is on the outside. I knot them before removing the yarn. Next, it is ready to tie onto the leader yarn on the bobbin I plan to use for plying. I secure the tied singles to the leader by first folding them over and through the leader loop. Then I pull the knot back through the loop created by the singles. When this is snugged up, I find that the singles are quite secure. After plying, it is easy to remove the yarn from the leader by pulling the knot back through the loop. No cutting needed. I like to use one of my cabled yarns as a bobbin leader. Cabled yarns seem to withstand both directions of twisting than do ordinary yarns. Getting started is a little tricky, and I have to admit that learning how to do this took some time and practice. The key to plying from a center pull ball is to keep both singles at the same tension during the plying. Otherwise, the looser single wraps itself around the tauter one. 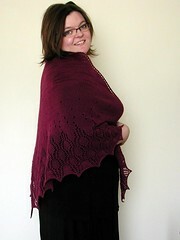 This is ok for certain designer yarns, but not okay for 'plain vanilla' type yarns. You can see the hand position that works for me in the photo on the left. The actual position of the hand isn't critical; you may need to experiment a little to find what works for you. What's important is keeping the tension of the two singles the same. When I first start plying, I treadle enough to get the twist started, then stop to make adjustments. One ply comes from the center of the ball, and the other unwinds off of the outside of the ball, but they do not unwind evenly! That means I may need to adjust my hand position or hand movements. Actually, I move the hand holding the ball very little, if at all during plying. I just keep an eye on the two singles as they unwind, and try to keep them the same length and tension. The first few yards are where I experiment with the number of treadles I'll need to match the 2-ply on my sample card. My sample card contains a short piece of freshly plied yarn off the bobbin. This shows me how the yarn wants to ply back on itself to balance the twist. To figure this out for plying, I count the number of treadles for a comfortable length of yarn, and then compare. The specific length isn't important as long as it is manageable for the spinner and remains consistent. If my 2-ply isn't perfect at first, I don't sweat it because the ends of a skein are often wasted anyway. I like the sample card comparison method of determining the amount of twist needed, as it is more accurate with singles that have been sitting around on the bobbin. Sitting yarn tends to temporarily set its twist, so unless the twist is revived, it's hard to judge how much to ply it. Once I establish a treadle count, I can get a rhythm going. pinch the point of twist, and let the plied yarn feed into onto the bobbin. As I feed in, the singles are pulled gently from the ball. If I need to, I stop treadling in order to reposition my hands to get an even tension. One potential problem can be if the center of the ball pulls out like (click here) this. That doesn't happen often, mostly if the singles are very fine, or the fiber somewhat slippery. In that case, it's better to make smaller balls to work with. Plying from a center pull ball, like spinning itself, is an activity that is learned kinestetically. Descriptions and demonstrations may be helpful, but in the end one has to learn by doing it. It is something the hands have to learn as well as the mind. That requires experimentation and practice. These in turn require patience with oneself and one's efforts. Not easy for those of us with a streak of perfectionism! Still, to me it was worth it. I've had so many people ask me how I do this, and I don't think I have ever explained it as well as you just did. Heh. I think I tried to ply from a centre-pull ball ONCE. I made an absolutely *dreadful* mess and went back to Navajo plying whenever I want no leftovers. For some, reason, a lot of my handspun works well as a three-ply anyway. I've used an Andean plying bracelet for spindle spinning, but not with a wheel; I don't think I'd be able to keep up (and then there's the fact that for wheel spinning, the bracelet would be the size of a football, and would take about an hour to wind, too). I think I will spin some cabled yarn just for leaders...I cannot tell you how many times my singles "un spin" when I go to ply! Your tutorial on ball plying is wonderful!!!!! I've never seen it described so well or better pictured. One of the few things I've done from day one. Ok, almost day one since I could never get two bobbins the exact same and my first couple of wheels only had small bobbins so I ended up with a bunch of small skeins of yarn. You have so much information to share. Thanks for taking the time to write these tutorials, taking the pictures and sharing them with us. Ooooh, my issue with plying from a center-pull ball is that almost ALWAYS the ends cross funny at some point and so I get bad snarls that I can't fix because both ends are occupied. But I am not the most coordinated person either, so maybe this has something to do with it? I have always found weighing my fiber gets me the absolute closest. I always assume my first ten yards won't be completely standard so I always add slightly more fiber to my first bobbin and then don't ply it to the bitter end. It works out well just about every time. But thank you for the tutorial, and btw, your Kromski is lovely, that dark finish is tres magnifique! My experience with plying from a ball starts off fine and ends badly. When I get near to the end of the ball, I start getting snarls and knots. Still, do I use it when I need a small amount of color in something and maybe one day I'll figure out how to eliminate the problems that comes when the ball shrinks. Thank you, thank you, thank you! I have had nothing but hair pulling when trying to ply from a center pull ball, but now I have some ideas on what I may need to change. I'll have to give it a shot the next time I'm going for a 2-ply! Maybe I'm too impatient to let the single relax or too uncoordinated in general (definitely true! ), but I can never make it through a ball without impossible tangles or occasional tension differences in the two singles. It's usually the worst when I get down to the end of the ball because things are so loosey-goosey at this point. My solution for the less coordinated (i.e. me :P) is instead of going straight into plying from the center pull ball, I take the two ends from this ball and wind a second ball with the two threads together. There are occasionally some tangles and yarn ball "burps" from the center, but they are much easier to deal with when you are not plying and treadling at the same time! And any uneven tension you might get while winding the second ball can be fixed when you ply later. It's an extra step, I know, but the tangles get me every time if I don't. Thanks for all your tutorials! I've learned a lot from them (especially the weaving tutorials, being a new weaver). So it's nice to actually be able to contribute something in return that someone might find useful out there. Rona, I think this is absolutely brilliant! I'm gathering from the feedback that this isn't an uncommon problem; indeed I've had it myself as well. I have to admit that I din't get this type of plying down pat the first couple of times I tried it; I was just willing to keep at it until I got it right! Thank you for sharing. I always have to remember that as you "ply" from the center-pull ball, technically one of the plies is cabled and the other ply is actually plied. I'm more concerned about using up all my singles, but I always have to remember that I'm adding some energy to the yarn when I do it this way. Great tutorial! I love the fact that plying this way takes away the wasteful factor of leftover singles on bobbins. Great tutorial as always. All your projects are just wonderful. Nice tutorial. Do you find that your yarns plied from a ball are not as balanced as those plied from two separate bobbins? I seem to have this problem quite often and i'm not sure if my balls of yarn have had the twist too relaxed compared to the bobbins and thus the plying twist takes over and skews the skein. Would love to hear your opinion. Thank you! Once I got the hang of plying from a center pull ball, I can't say that I've noticed much difference in balance compared to bobbin plying. That's assuming I have even tension on both singles. 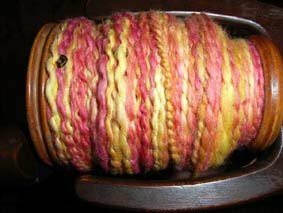 It also depends upon whether the singles are freshly spun, or have been sitting on the bobbin for awhile. That's why I like to let the fresh singles twist back on themselves, and them remove this for later. If I'm able to match the twist in that little sample, then the yarn turns out nicely balanced. I hope that answers your question! I'm a new spinner and I hate to waste yarn so I'm determined to master the center pull ball. Great explanation and pics!